We attend country shows throughout the summer months. We set up a static display of member’s vehicles and display area too. Where land permits, we set up an off road course to offer passenger rides in exchange for a donation to our chosen charity of the year. We generally have a small marquee with display materials and a number of vehicles on static display. The club carries public liability insurance for the static display and for giving rides to the public, so our members are not at risk. 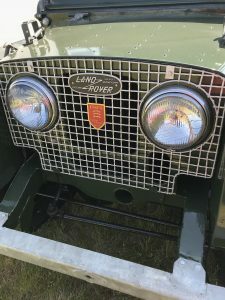 When attending shows we have to be on site for the full day, and we ask that we have several people on the stand at all times, but it does mean that you get a chance to have a look round the show too. We are there to showcase all aspects of club life including greenlining, Rover Rescue and our competitive events. At some shows, depending on space available, a small ‘arena’ driving area and scenic drives may be available, where we offer rides to members of the public for a donation to our chosen charity of the year. The club carries public liability insurance for giving rides to the public, so our members are not at risk. Check out the Contact Us page for more information on how to get involved.